Business and internet look to spread their reach to the maximum extent. However, the internet is independent and business relies on it for expansion. So, if you are into any store business then, with store WordPress themes you can own a WordPress website. A website will act as a window to the virtual world. And the easiest way to get a website for your store is through store WordPress themes. In fact, you’ll find features like WooCommerce integration, payment gateways convert your store to an e-store. Basically, you can set-up another branch of your store on the virtual space using a store WordPress theme. These themes give a layout where you can showcase the product images along with the price tag, you can sell products, collect payments and do a lot more. Suppose you’ve got a new business which is of cloths like religious, wedding etc. To make it more popular you’ll seek for new strategies. So a website on WordPress is the also a medium of expanding your business as there are too many users present on it. The more visitors you gain, the more will be the customers. And only an attractive WordPress site can help you to achieve it. That’s why here we’re with some of the best WordPress store themes which can help you in building & transforming your site. Some of them are free while others are paid. You can post the clothes & products on sale. Apart from it, these themes have a feature that you can also earn a secondary income by posting other’s advertisements on your site. That’s why we believe that you must try them once! 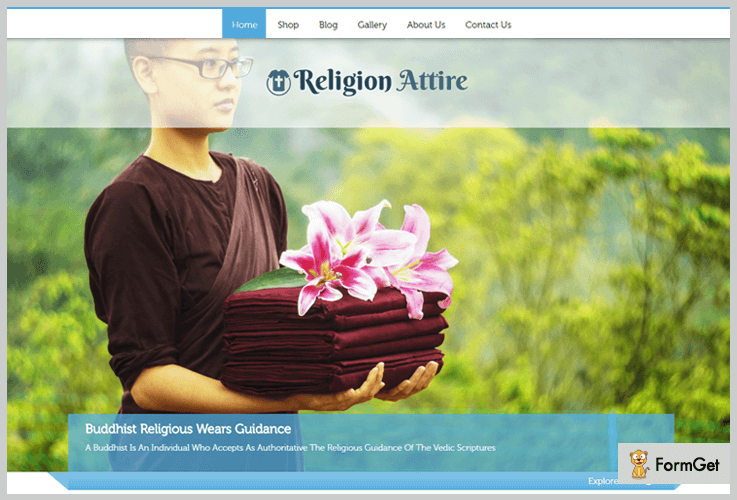 Religion Attire by InkThemes is a store WordPress theme for the religious & traditional wear stores. Its banner image attracts most of its visitors to gather & buy some religious apparel. Apart from it, there are 8 unique color styles with it. Via them, you can transform the look of your website in a very pious way. How Much Does Religion Attire Store WordPress Theme Costs? This product of InkThemes charges only $79 as a one-time payment & accessibility for a lifetime. If you want something different on your site, they also provide theme customizations for it. What Are The Features of This WordPress Theme? You can showcase your religious products in boxes containing two images & information about them. Through its lead capture form, people can ask anything from you regarding the religious items of clothing. This is how you can get to know about their views. On its 4 column footer area, you can add any elements up to four. For example the image gallery, contact info, apparel categories, your ideal thoughts about religions etc. If you’ve got a business of swimwears & want to expand it more, then SwimWear is a right choice for you. It comes with a predefined template for your business where you can showcase the beachwear products. Also, you can post the trending swimwear clothes on your site to attract more of the beach lovers. What’s the Cost of This Store WordPress Theme? It only charges $79 which is a one-time payment with lifetime updates & support. Is this WordPress Theme Really Promising? 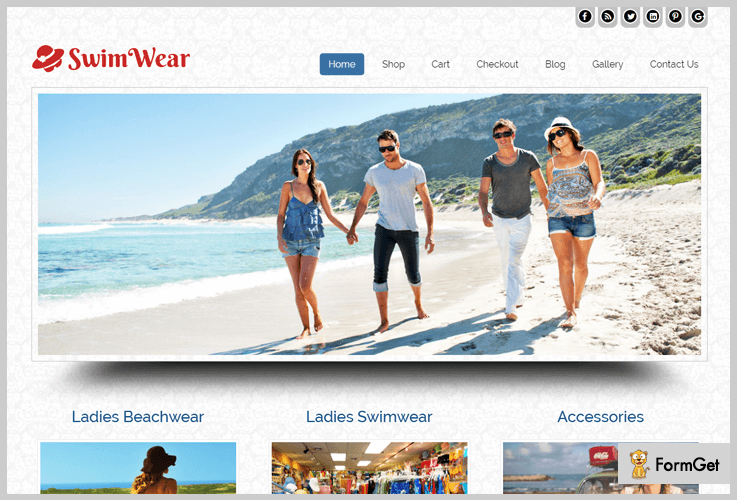 This WordPress theme is integrated with WooCommerce such that you can easily post the beach apparels for sale. On its 3 column feature area, you can share the images of any featured dress & its description. This will help in showcasing any best products of yours. You can also earn by posting advertisements of others on your site. By doing it, you’ll be able to earn a secondary income. FormalAttire is also one of the best templates in store WordPress themes. 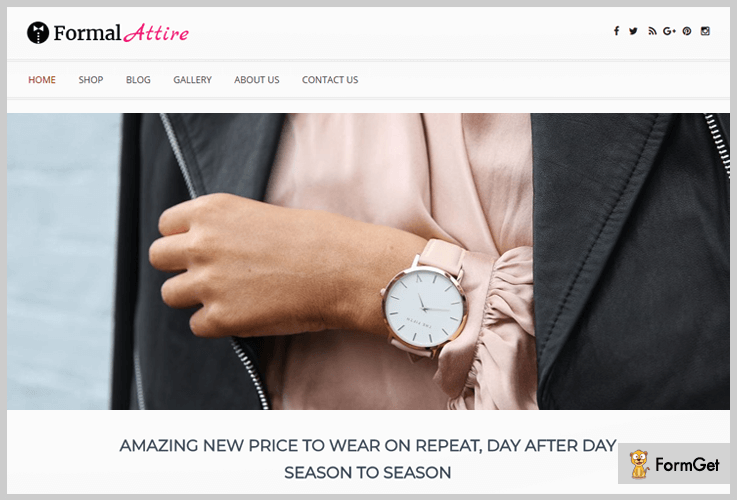 If you have a clothing store of formal apparels then this WordPress theme is best for you. Your customers can easily purchase any product from the website by using PayPal payment system integrated with it. You can also display your most rated products on the right sidebar in order to grab the attention of the visitors. Is This Store WordPress Theme Worth Buying? Yes! We’ve only listed this WordPress theme as it is of a unique category. You’ll be charged only $79 along with regular updates. What Makes This Store WordPress Theme Unique? The banner image slider has 4 different layouts & you can also add the blog images as well as their links too. You can also add the testimonial section to display the reviews of your customers. In place of testimonials, you can also feature ay latest product of yours. One can also showcase an unlimited number of images of products on the gallery page of the site. So the customers can separately see them without getting confused. 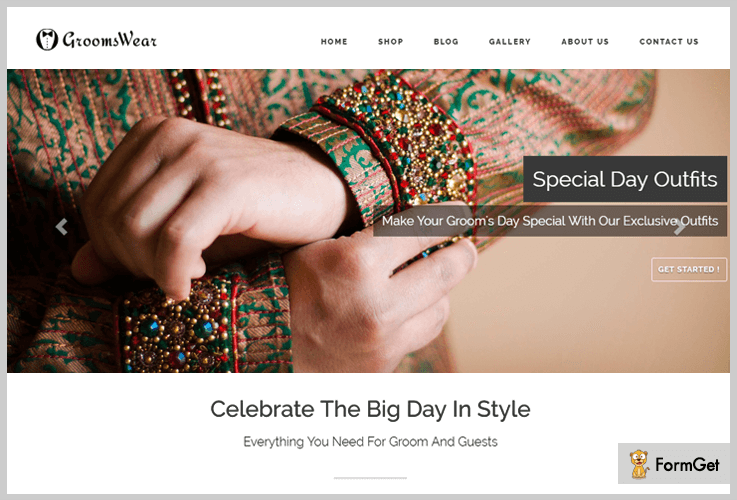 GroomsWear by InkThemes can provide you an online shopping platform for the grooms. As wedding clothing products of a groom are colorful that’s why this theme has 10 different color schemes. By using them, you can build a featured WordPress site without any hindrance. What Are The Charges Of WordPress Theme? GroomsWear only charges $79 for the lifetime. Along with this one-time price, you’ll get 24/7 support for the duration of your subscription. What Features Make This Store WordPress Theme Unique? You can add any kind of clothing video on your site to display it to your customers. There is a logic ‘More videos, more versatility, more customers’. One can display the best comments of the customers in order to attract the new ones. It has an inbuilt contact form through which, your customers can reach out to you at any time. 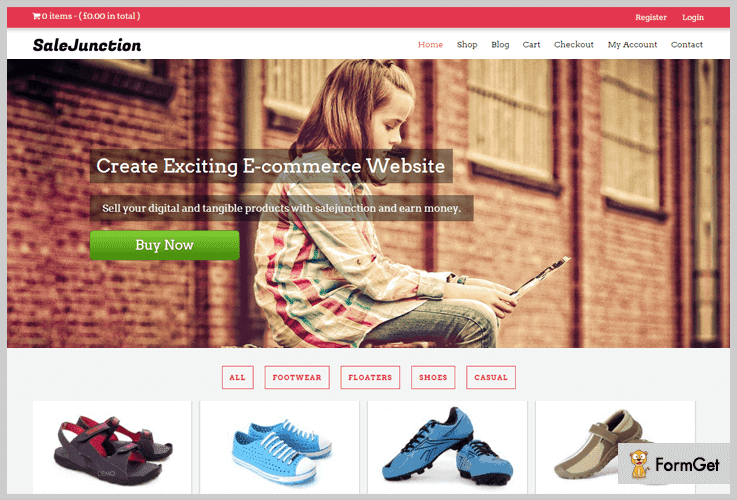 SaleJunction by InkThemes is a multipurpose free WordPress theme which is fully customizable according to any business needs. That’s why it can also be used in the category of WordPress store themes. With the help of it, you can create any kind of e-commerce website for your business. What’s Different About Its Pricing? The most noteworthy fact about this WordPress theme is that it is free of cost. That’s why if you don’t know how to start using these all themes, you can try this one at first. Does Free Means Limited Features? Nope! Your customers can also ask any queries from you even from the comment section on the about page. You can show the latest posts in order to make the visitors remember: ‘This website is highly active’. Apart from it, you can transform it according to any kind of business site. That’s what makes it versatile. So above some of the best store WordPress themes which you should try once. Some of them are free while others are paid. You can post blogs of some trending clothing style & also post the products for sale on your WordPress store site. Apart from sales money, you can also earn a secondary income through adding advertisements on your site. See! All of these facilities you’ll get with them & a lot more are coming. So just try them & take your business to a next level! Please comment below for any queries/suggestions & we’ll surely solve them!